Yes, I know you can buy a jar of marinara sauce that means you will have sauce in NO minutes – but hear me out. After many years now of eating less processed food, I have trouble with eating jarred tomato sauce (though I do buy it from time to time). I find it difficult to find one that doesn’t have added sugar or doesn’t taste too salty. What happens when you eat mostly fresh food is that you begin to crave it. Some brands of spaghetti sauce taste like ketchup to me – yuck! But, I don’t want to spend lots of time peeling tomatoes, cooking them down, and grinding them in a food mill. I have made tomato sauce from scratch and I inevitably get covered in sauce, sweating up a storm. No, this is not for me. I am here to tell you that there IS a middle ground. All you do is sauté a little garlic and spices in olive oil, add a good quality can of crushed tomatoes, and (secret ingredient) lemon zest and you will have a sauce that tastes quite good – much better than jarred sauce and (wait for it)….less expensive. Hurray! Lemon zest is made from the outer, yellow section of the lemon. You can use a zester to scrape off the zest or you can peel it off with a vegetable peeler and mince it with a knife. Lemon zest gives this sauce a POP of flavor. You can freeze it or use it in a week. I put this sauce on pasta, pizza, roasted vegetables, rice, whatever. Half a cup has 12% of your daily value of iron – you can’t go wrong. Do you make your own tomato sauce? How do you do it? Put olive oil, red pepper flakes, salt, garlic and oregano in a cold saucepan. Heat to medium and sauté for one minute without browning the garlic. Add the crushed tomatoes, stir, and heat until simmering for about five minutes. Remove from heat and add lemon zest. Serve immediately or store for later consumption. Is This The Spaghetti of Your Dreams? Thank you for this! I, too, feel odd about using jarred sauce, and this is not an ordeal!! I'm glad you suggest cooking the garlic a bit first. And I've never used lemon zest in tomato sauce. I often make sauce like this, but my husband found the consistency too close to canned tomatoes & not close enough to sauce. To change all that I take another Snack Girl favorite, canned pumpkin, and add a 1/4 cup to the sauce. It does not taste pumpkin-y, only adds a nice thickness to the sauce. Plus a dash of nutmeg to pretend I'm some kind of fancy chef. I'll have to try the zest, I had never heard that one. This is just how our cook made her sauce when we stayed in Tuscany. She said that she did use fresh tomatoes when they were abundant. No food mill though, just blanch, peel, and chop! I make a similar sauce but use diced not crushed tomato and some capers. They simmer in their own juice just as long as the pasta cooks & then add fresh basil and a bit of the pasta water. Plan to try adding lemon zest next time. Thanks for all your great ideas. Do you drain the juice off of the tomatoes first? I don't even saute my garlic - I just toss in. Here's mine: 1 can crushed tomatoes (drained), one can of tomato sauce, a couple spoonfuls of garlic, some oregano, paprika, onion and whatever I can find to throw in. My tomato sauce is much like yours, SG, but FRESH basil, oregano, n thyme make the taste MUCH better! Also just a pinch or two of sugar is a plus, dont know why. I grow my own herbs and tomatoes too, so sometimes they're diced, sometimes crushed. I cook it down for 20 mins or so, so it's thick. I also can it! Thank you for this! I have a favorite jarred sauce. I know it has too much sugar and sodium, but I haven't found anything I've liked as much (even other better-for-you sauces). Maybe it's time to nip it in the bud and just not buy it anymore... my taste buds will eventually get used to not having that flavor. (Kind of like people who need to eat less sodium or are trying to get away fake creamer in their coffee.) I will give this one a try! I Enjoy A Chunkless Mild Sauce (No Crushed Tomatoe Garlic Onion Rosemary Salt). My Version Is Water Tomato Paste Marjoram Basil Oregano Thyme Savory Olive Oil. Because I Enjoy The Prego Brand Mine Has 1/2 tspn. of Sugar. I Read Their Label Then Omitted What I Didn't Like. I'm Not A Marinara Fan. If I Were Then Garlic Onion. Meanwhile White Corn Tortilla Pizza. One Quartered White Corn Tortilla Salt Tomato Sauce Mozzerella Cheese Any Meat/Combination Banana Pepper Mushrooms Kalamata Olives (In Place Of Oil). It Came Together In Ten Minutes. The Corn Tortilla Foundation Added Flavor to It. I use whole tomatoes, you can either crush them with your hands or put the, in a blender, by using whole rather than crushed you ensure certain that you are not getting part of less than perfect tomatoes. Saute garlic and onion, add the tomatoes, oregano, basil and a pinch or brown sugar. if I want to thicken the sauce I add tomatoe paste. Just what I've been looking for!!! Thanks loads. Might also use fresh tomatoes if my energy holds up. That's a lot of fat for just a half a cup. 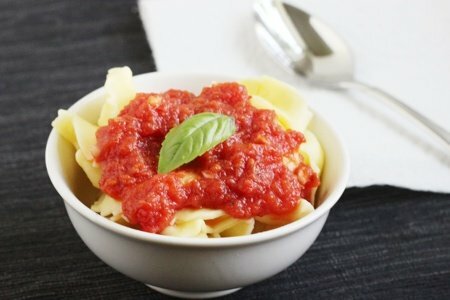 I too am weary from trying to determine the right marinara for my family and feel I am cheating my guest by presenting a sugary, ketchupy dish from expensive and gimmicky jarred sauces, when it should not be that hard to make a better, more economical, fresher and better tasting meal using canned tomato base. Thanks for the lift and the great advice. I was wondering, anyone tried peeling the tomatos then blend them with a blender or food processor before tossing in pot to cook and thicken? That might take less time for the tomato chunks/bits to breakdown into a sauce (maybe)? @Burlla, the entire recipe, only fat comes from the 2 tablespoon of olive oil. Each serving of olive oil is 1 tablespoon composed of 120 calories containing 15g of fat. 2 tablespoons double that, divided by approx 7 (3.5 cups, serving size is 1/2 cup so that's total 7 servings in this recipe), brings the fat content down to actually below 5g (4.29g, but that's close enough), and approx only 34.29 calories. Olive oil is composed of good fats that human beings need and should NOT be cut out just based on calorie calculation. compared to buying jarred sauces with an ingred list looking like something from a cosmetic company, i'd rather go for knowing what's going on in what i'm putting in my mouth! For what it's worth, if I have fresh tomatoes on hand, I make sauce without bothering to peel or run through a food mill. The peel and seeds carry lots of flavor, and once you cook it down until it's thick, you don't even notice the skins, especially if you've diced the tomatoes small to begin with. I actually think it's a nice texture. This recipe seems really similar, almost identical, to Heidi Swanson's Five Minute Tomato Sauce from 101cookbooks. The inclusion of Oregon in your recipe seems like a well needed finish in flavor. Love it! Thank you Snack Girl! This is absolutely delicious. I've complained for years about the jarred spaghetti sauces - they taste like pure sugar. We had it one night with spaghetti & meatballs. The next night with chicken breasts. So enjoyable and easy!